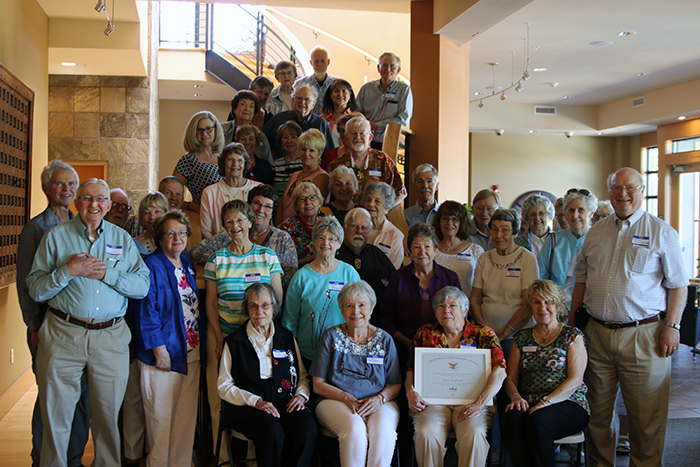 CRI members celebrating the program’s 25th anniversary on July 11th. Donn Charnley: middle, second row from the top. Carol Crawford: far right, bottom row. Photo courtesy of Edmonds Community College. One Edmonds Community College instructor said lifelong learning might be the secret to staying young. “I feel like I’m only 68,” said 90-year-old Donn Charnley, who has taught geology classes at Edmonds CC’s Creative Retirement Institute (CRI) for 15 years. The institute is celebrating its 25th anniversary this year and is a member-driven program that offers a variety of non-credit classes, meaning no homework, no exams – just a passion for learning. CRI prides itself on having instructors who are distinguished in their field. Charnley is a professor emeritus of geology at Shoreline Community College, where he taught for 32 years. He’s also a former Washington state representative and senator. CRI has many dedicated instructors, members, and volunteers. Those who get involved, tend to stay involved but none more than Carol Crawford. Crawford can be found volunteering at the CRI front desk just about every weekday. She’s served more than 4,000 hours and was recently recognized with the President’s Lifetime Achievement Award for those who contribute more than 4,000 hours of service in their lifetime. Crawford earned the achievement in just 15 years, and has been volunteering with CRI since 2003. As CRI celebrates its 25th year, it counts among its achievements an active member base of more than 350 participants, more than 100 volunteers, and 29 classes to choose from this fall. CRI also has an 18-member advisory board with seven committees that plan curriculum, arrange for instructors, take care of administrative tasks, and most importantly – keep the audio and video equipment running so classes go smoothly.